That little three-letter acronym—which stands for cannabidiol, one of the many chemical compounds called “cannabinoids” that naturally occur in cannabis plants—wasn’t familiar to many Americans several years ago. 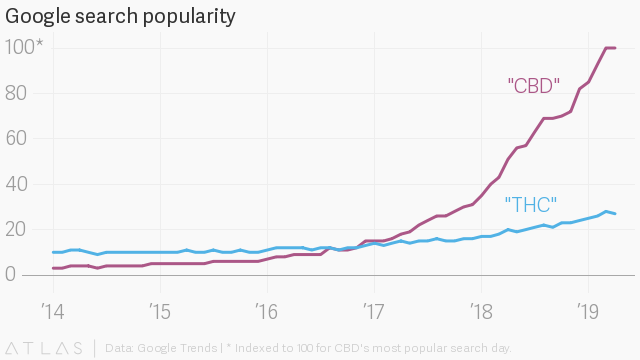 But in 2016, CBD became more widely searched on Google than THC—the cannabinoid most famous for getting users high. And it’s been climbing ever since. In a recent survey conducted with the the Harris Poll, Quartz asked over 2,000 Americans about their use and perceptions of CBD. The results show that the vast majority of people in the US are aware of the cannabis-derived compound: some 86% of survey takers had heard of CBD. Still, fewer than 20% have tried it, and only 7% say they use it regularly. If you or someone you know hasn’t already tried CBD, whether by rubbing a balm into aching joints, dropping a sublingual tincture before bedtime, popping a gummy, or vaping from a device stocked with CBD oil, it’s likely you’ve been exposed to marketing for it. The San Francisco-based cannabis delivery platform Eaze called CBD “the breakout star of 2018,” citing that the number of costumers buying CBD products doubled from the previous year, and some analysts have predicted the US market for hemp-derived CBD could reach $22 billion by 2022. And while it certainly feels like everyone is using the stuff, and data from cannabis analysts and companies suggest as much, we are just beginning to understand how everyday Americans—perhaps those who don’t live in places where “magical CBD lattes” are prevalent—are interacting with CBD. Those surveyed consider it more of a wellness aid than a recreational drug, like marijuana or alcohol: only 22% said they used CBD socially or as a novelty. 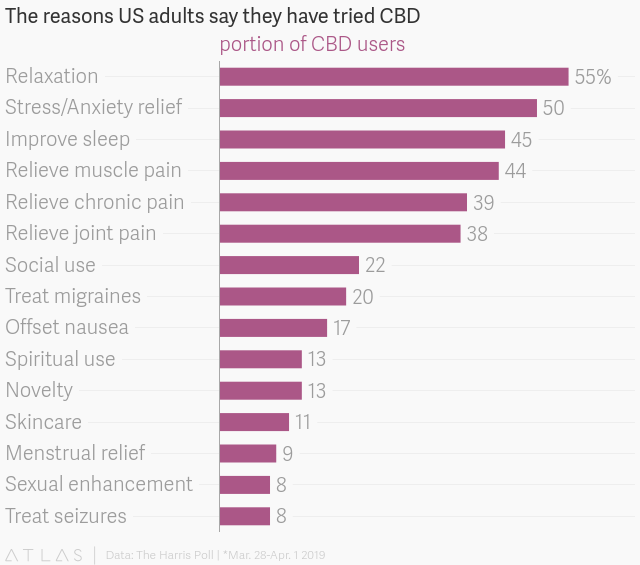 About 55% of those who have tried CBD say they used it to relax, and another 50% said they were looking for stress and anxiety relief (respondents were allowed to give multiple answers for why they used CBD). 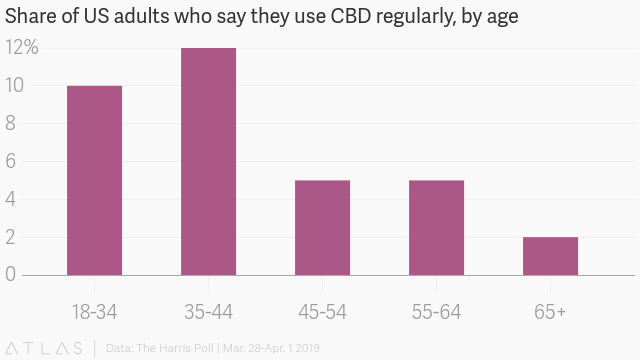 Over 10% of Americans between 18 and 44 years old use CBD regularly, about double the share of regular users over 45. That might be because millennials are experiencing debilitating anxiety at twice the average rate in the US. 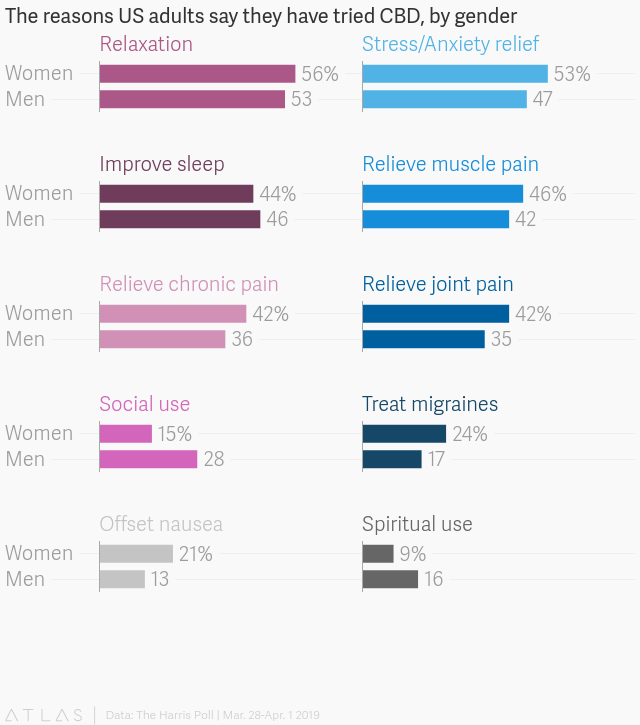 People who turn to CBD for health reasons were likelier to be female, while men indexed higher for social and spiritual use. And while this lucrative and growing intersection of women, wellness, and weed is giving rise to a boom of new cannabis companies marketed towards women, men are actually both more likely to have tried CBD, and more likely to use it regularly. Approximately 10% of men responded that they use CBD on a regular basis compared to just 4% of women. 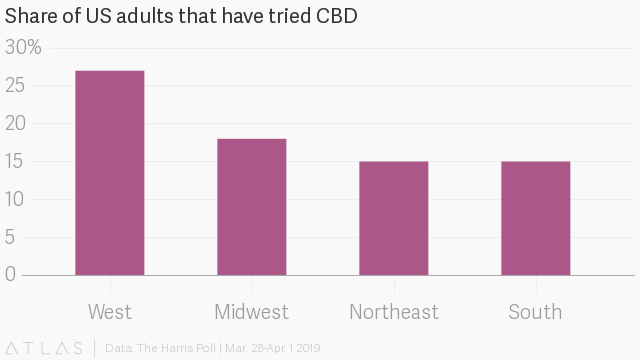 Over a quarter of people living in Western states have tried CBD. That’s true of fewer than 20% of people in the South, Midwest, and Northeast. That might be because while hemp-derived CBD is widely available, consumers in states where cannabis is legal and some of the best-known CBD brands are based—Colorado and California the most prominent among them—are likelier to have encountered products made with CBD. Of the large majority of Americans that have heard of CBD, over 80% support its use. About 56% say they support using CBD as a replacement for prescription pain killers. Almost half of those surveyed also support using CBD to replace prescription drugs for fighting anxiety. Research to support both these use cases is limited. In lab rodents, studies have shown that CBD helps to alleviate various sorts of pain, when administered both orally and topically, but clinical studies in humans are lacking. The same is true for research into its effects on anxiety. While Jeff Chen, director of the Cannabis Research Initiative at the University of California-Los Angeles, told WBUR that “CBD actually has a pretty favorable safety profile,” he added that those worries are not misplaced, and more research is necessary, especially in areas such as using CBD with prescription drugs, or while pregnant. The uncertainty around CBD might make some potential users anxious, but, at least based on our survey data, it seems many are willing to take their chances. Looking for more in-depth coverage of cannabis? Sign up for a free trial of Quartz membership, and read our premium field guide on the multibillion-dollar cannabis wave.